Soon after USA Hockey revealed its Olympic roster Wednesday, general manager David Poile sat before a room of international media at the Winter Classic and said, "We expect to win." Recent history suggests they won’t. The Sochi Games mark the fifth Olympiad featuring NHL players. Poile himself acknowledged the trend over the previous four: The United States won silver on North American soil in 2002 and 2010. But the Americans failed to medal on the larger, Olympic-sized ice sheets in faraway Nagano and Turin. The 100-foot-wide surface in Sochi will be just as roomy. The Americans haven’t won gold since the eternal triumph in Lake Placid 34 years ago. Their last medal outside North America came at the 1972 Winter Games in Sapporo, Japan. So, yeah, it’s been awhile. That doesn’t mean American fans should lament ice dimensions or distance traveled while conceding gold to the Canadians, Russians, Finns or Swedes. There are reasons to believe in the 25 names you heard Wednesday. The U.S. talent pool has never been this deep, and, aside from a second-guessable pick or two, USA Hockey management built a team suited for this tournament. Poile talked Wednesday about the excruciating choices, saying, "It’s the first time we’re having to make similar decisions that Canada has had for years, where we’re leaving off top, top players." And while Canada still possesses the most hockey talent on aggregate, the U.S. has closed the gap because of sheer scale (nine times the population) and developmental advances. The Americans have won the IIHF World Junior Championship — the closely-followed, litmus-test, under-20 tournament – twice since Canada’s most recent triumph in 2009. At some point, that should have relevance once the big cauldron is lit. In fact, the 2014 U.S. Olympic roster includes three players — forward Derek Stepan and defensemen John Carlson and Cam Fowler — who won gold on Canadian soil at the 2010 World Juniors. This is the start of a new window to win. Provided the NHL continues sending its players to the Olympics — which is far from certain – time is on the Americans’ side. 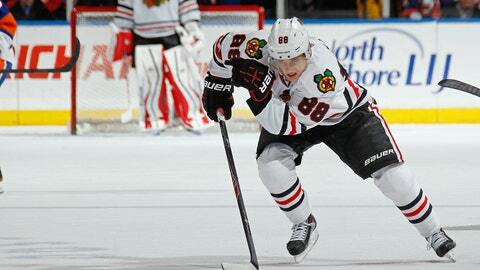 Patrick Kane brings offensive punch to the US Olympic team. In that way, this Team USA bears no resemblance to the edition that flopped the last time the Olympics were held in Europe eight years ago. As a matter of fact, it’s also different from the version that nearly stole Canada’s preordained gold in 2010. Veteran leaders Jamie Langenbrunner, Brian Rafalski and Chris Drury have since retired. Potential returnees Bobby Ryan, Erik Johnson and Jack Johnson were left off the roster – and controversially so, particularly with Ryan. So, what do the Americans have? Their top forwards – Patrick Kane, Ryan Kesler, Phil Kessel and Zach Parise – are in their primes and demonstrated their Olympic bona fides in Vancouver. David Backes and Dustin Brown bring physicality up front. Goaltender Ryan Miller is having his best season by save percentage since 2010, when a sensational effort for Team USA earned him tournament MVP honors. The defensive corps has only two returnees, Ryan Suter and Brooks Orpik, but that is partially by design: The larger ice surface puts a premium on skating, and younger legs tend to skate better. So the roster includes five blueliners – Kevin Shattenkirk (24), Ryan McDonagh (24), Carlson (23), Fowler (22) and Justin Faulk (21) – who have yet to turn 25. But it was apparent from Scott Burnside’s fascinating behind-the-scenes report on ESPN.com about Team USA’s deliberations that key decision-makers — namely director of player personnel Brian Burke – were turned off by Ryan’s other traits. Burke called Ryan "passive" and "not intense" during a conference call with Team USA executives, according to Burnside. Especially because Ryan played for Burke in Anaheim, one assumes Burkeâs opinion carried great weight among Poile and others. So, barring a forward injury, Ryan won’t go to Sochi. The decision will be debated and dissected for days, weeks or maybe even longer than that. There’s only one way for Team USA to muzzle any outstanding critics, and that is to stand atop the podium Feb. 23 with gold medals around their necks. Are the Americans the favorites to win? Probably not. But they have a much better chance to triumph in a distant land than they have in a very, very long time.